To watch a bird in flight is fascinating. Often, as city-bred people, we notice a bird taking a short flight from one treetop to another and marvel at its ability to fly and glide and neatly perch itself on a treetop. However, did you know that there are birds that fly great distances to reach their destination? These are the migratory birds that move from one place to another, essentially to warmer climes. If you have ever observed migratory birds flying, you’d notice that they always fly in a perfect V-formation, akin to a fighter plane sortie, if you have chanced upon seeing one. While our fighter pilots probably get to learn about this in their trainings, the birds have got this figured as a part of their natural evolutionary process. Without delving into the relative smartness of humans and … birds, let us understand why this unmistakable formation is the only option for the birds, which set forth trans-continental journeys every year. Good old Physics tells us that air always flows from a region of high pressure to a region of low pressure. This incidentally, is the primary reason behind the existence of wind or breeze. A winged flight requires low-pressure region above the wings and high pressure below the wings to create uplift. The difference in the pressure creates a lift and this enables the airplanes as well as the birds to fly. 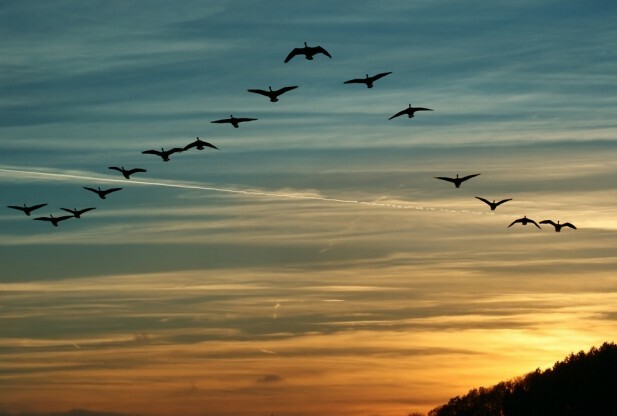 But, what exactly does this pressure gradient theory have to do with the birds flying in a V-formation? 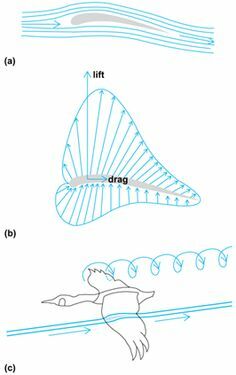 Flapping of wings: When a bird pushes its wings downwards, it creates a strong low-pressure region above the wings and high-pressure underneath. The strong pressure that develops under the wings of the bird, forces the air to flow to the low- pressure air above the wings. The flow of air is mostly observed at the tip of the wings during the down stroke. The phenomenon is not usually observed or very strong during the upstroke because the feathers create gaps to let the air escape from the top of the wing to bottom. However, the down stroke motion of the wings creates a very strong airflow in a forward direction since birds fly in the forward direction. This airflow creates a wingtip vortex, extending from the tip of the wing in the opposite direction of flight. These vortices are very persistent and extend along the flight path as long streaks. They are rotating in the opposite direction while the right wing vortex rotates in the counter-clockwise direction. The left wing vortex rotates in the clockwise direction. These air rotations induce airflow patterns around the surrounding air. As the rotating vortex of air rolls of each wing tip, the vortices mean that the air at the immediate behind of the bird gets constantly pushed downwards and the air behind it and off the sides gets pushed upwards. If a second bird flies in either of these upwash zones, the bird gets a free lift. Energy can be saved by drifting off the airflow created by its mate in the flock. It is observed that birds at the back of the V formation have slower heart rates as compared to those in the front and also flap less often. The bird, which is at the foremost point, works the hardest by being the first to break through the air resistance offered to the flight. This is analogous to a situation where a kid is following the trail of his parents while walking on the snow. Following the parents’ footprints is easier for a kid because they have already crunched the snow down. Similarly, the lead bird leaves a smoother air with less drag and hence more lift behind it. The lead bird creates a trail of air turbulence that helps in a smooth lift for the rest of the birds in the flock along the V-shaped direction. The lead bird does not always stay as the lead bird while flying. As time passes, it drops to the rear of the formation, and another less tired bird takes the lead, breaking through the air first. Thus, the birds position themselves to fly just behind and to the side of the bird in front, with accurate timing to their wing beats, in order to catch up with the uplifting eddies. 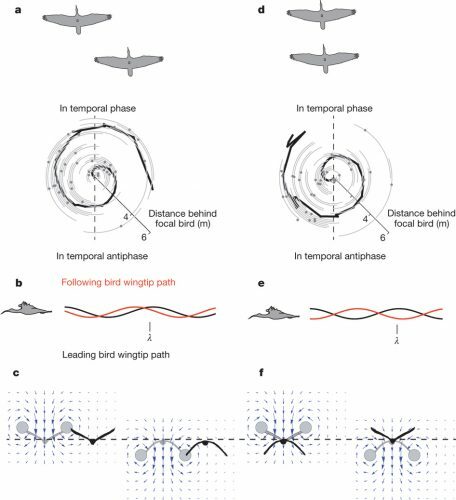 Scientists’ are yet to figure out, how the birds find this aerodynamic hot spot, but they suspect that the birds align themselves either by sensing the flow of air currents through their feathers or by sight. The former one is a logical and probable reason. A mistake by the leader can cause ripple effects through the rest of the flock, causing traffic jams in their flight. Investigations are still on to figure out how the birds decide on who sets the course and the pace. Certainly, the birds in a V are pulling off a feat, which is impressive, albeit a little complicated to understand their seemingly deft organization abilities and camaraderie.